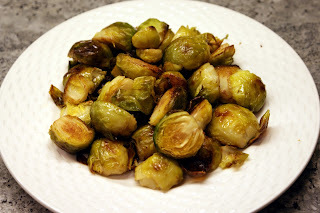 As a kid, my mom would make Brussels sprouts for dinner. My dad cheerily would say “can you feel the vitamins coursing through your veins?” Ummm…no. Then he would cut them in half and say “now they are smaller bites.” Yes, but now I have 2 bites vs. 1 to choke down. And what do I do as a parent? I cook Brussels sprouts. Do my kids like them? Not really but it is something green on their plate (I also give them a Flinstone vitamin with their breakfast just in case they hide their Brussels sprouts in the mashed potatoes like I did). At this point, I’ve decided that writing to you through the blog has to be better than therapy. No one asks me probing questions “how did this make you feel?” or “what other kinds of issues did you have with your parents?” and it’s a heck of a lot cheaper so thank you! PS - buy a good bottle of extra virgin olive oil and Kosher salt. It's going to be one of those weeks. Wash the Brussels sprouts then cut off the ends and remove any outer leaves which don’t look good. I then cut the sprouts in half. Toss with the olive oil, salt and pepper to coat. 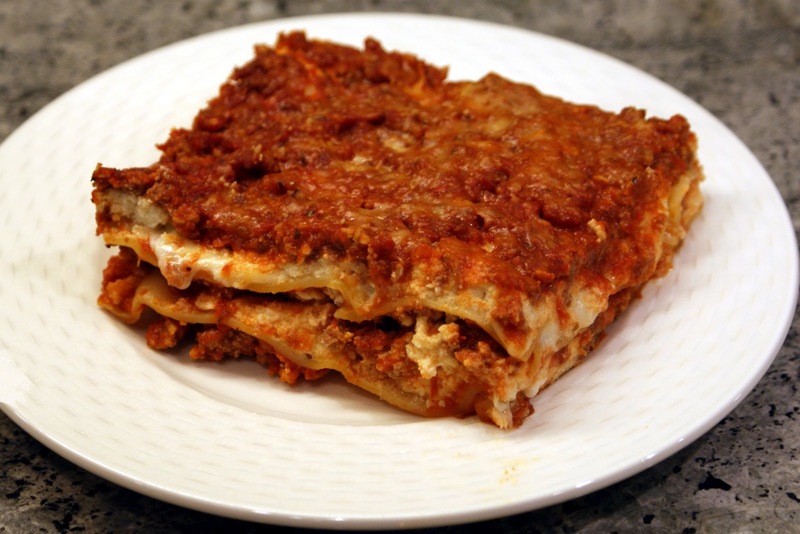 Spread into a single layer on a cookie sheet or pyrex dish. Roast for 35-40 minutes (mixing/flipping periodically) until crisp outside yet tender inside. Once done, sprinkle with more salt. Have you ever had your heart set on a certain food and then you arrive at the place salivating and that food is not there? 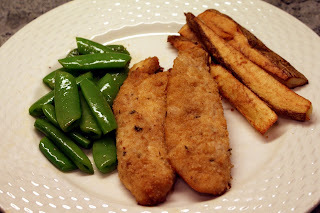 My heart was broken last week – in the cold rain, no less – while searching for snack for Sunday school so I was being sort of holy... (Can you hear the violins playing in the background signifying my sorrow and woes? 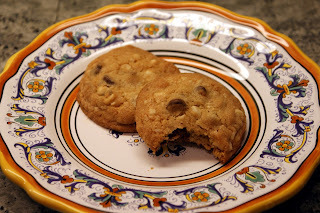 A teardrop falls...) Empire Baking Company used to serve delicious chocolate chip cookies with macadamia nuts. I must have been their only fan because they have stopped. My kids are fine with that because the M&M cookies are still available. I love the crisp, clean crunch of a macadamia nut. 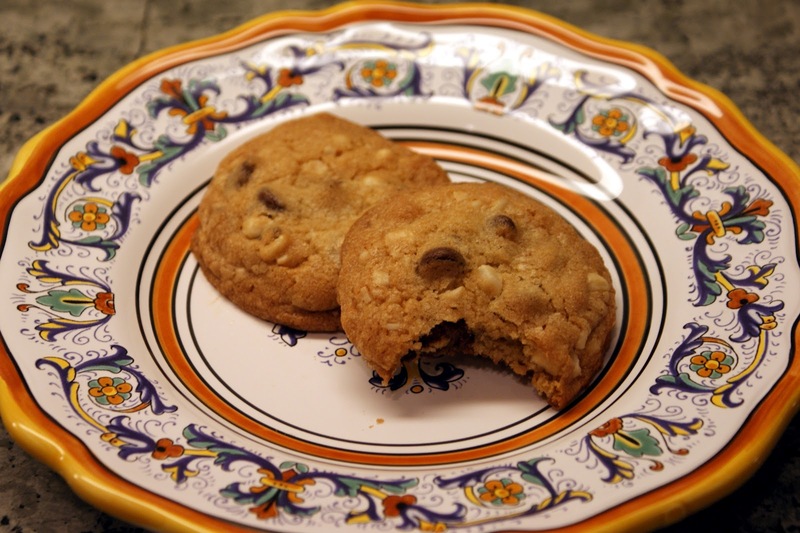 I used the basic Tollhouse cookie recipe (yep, the one on the back of the semi-sweet morsels bag), chopped macadamia nuts with my nut chopper, stirred and baked. In the words of Cookie Monster: "Me want cookie! Me eat cookie! Om nom nom nom." 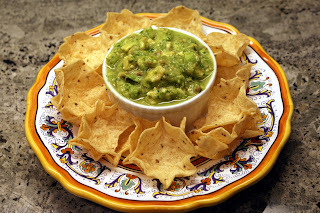 Place ingredients 4-7 in a mixing bowl and beat until creamy. Add eggs, one at a time, beating well into the mixture. Gradually and slowly (so as not to create a dust storm) beat in ingredients 1-3. Pour in chocolate chips and nuts and stir. (I like to refrigerate the dough for at least 5 minutes – the colder dough rolled into a ball tends to create thicker cookies). Spoon about a tablespoon of dough and roll into a ball. Place on an ungreased cookie sheet and bake 9-11 minutes or until golden brown (mine take 14 minutes since they are cool from the ‘frig and are in a ball). I miss the cookies, Empire, but you still make the best challah in town. Hey, hey, hey – it’s Fat Tuesday! Mardi Gras is French for Fat Tuesday which “refers to the practice of the last night of eating richer, fatty foods before the ritual fasting of the Lenten season, which begins on Ash Wednesday.” So let’s get our fatty on with a few recipes that look oh so good but your cardiologist and trainer would not endorse you eating on a regular basis. Pancakes are a traditional food – been there, done that - as well as other related fried breads or pastries. Start your own tradition and try a few of these! David makes the best French toast using challah. Seriously, it’s that good – come over one Saturday or Sunday – I welcome an excuse for him to make it. I think it’s the teaspoon of vanilla. 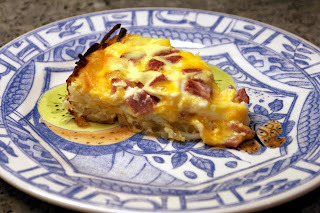 And then I came across a FT casserole by Paula Deen which my friend Angela endorsed having tried it before. 15 years of marriage and I feel as though I’m cheating. Ca c'est bon! C'est magnifique! Merci Beaucoup PD! Want to know why this qualifies for the Fat Tuesday post? French bread soaked in 2 cups of half-and-half and then essentially topped with a praline - 2 sticks of butter and 1 cup of brown sugar. The recipe calls for maple syrup but the extra flavor, sugar or calories would just be too much. Cut yourself a small piece and commit to eating better tomorrow. For French Toast: slice the French bread into 1-inch thick slices. Arrange bread in 2 rows in a generously buttered 9x13 baking dish. Overlap the slices or arrange to minimize the non-bread space. In a large bowl, combine ingredients #2-8 and beat with a whisk until blended but not too bubbly. Pour mixture over the bread slices, making sure all of the bread are covered evenly with the milk-egg mixture. I removed the top layer, poured some egg mixture, flipped the bread and then placed the top layer of bread down and poured the remainder of the egg mixture. Your goal is to ensure all of the bread is covered. Cover with foil and refrigerate overnight in the refrigerator. For Praline topping: place all ingredients in a bowl and mix well. 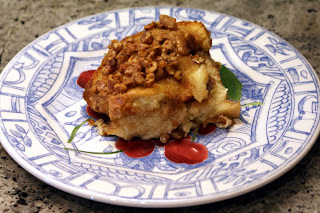 Spread Praline Topping evenly over the bread and bake for 40 minutes, until puffed and lightly golden. 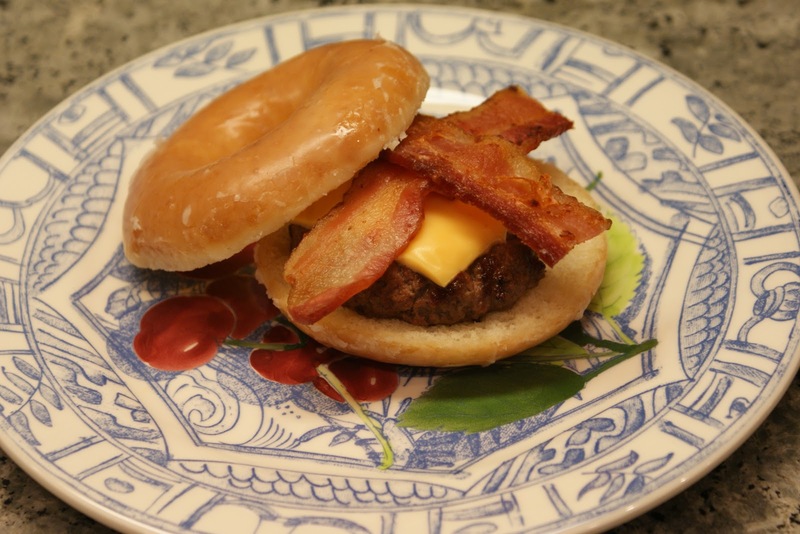 Paula Deen does it again. Oh so good yet oh so you can’t eat this everyday. Our kids love to eat quiche. In our house we call it “egg pie” because who doesn’t like to eat pie for breakfast? After spending more than my fair share at Whole Foods buying prepared quiches, I started searching the web for recipes and came across this one. The hash brown crust caught my attention! I adjusted components and quantities of the recipe based on reviews. Here is a link to Paula's original recipe. Thaw the hash browns. Once thawed, dry them as much as you can between paper towels. Place them in a 9 in pie pan and mix with the melted butter. Spread evenly on the bottom and sides of the pie pan – this will form your crust. Bake the hash browns until golden brown or starting to crisp. It took me about 25-30 minutes for them to start browning. The sides browned first; the middle takes longer. To expedite the browning at the end, you can either turn up the oven to 500 or broil for a few minutes to achieve greater browned consistency. While the crust is baking, mix ingredients 3-7 in a large bowl (you can adjust the ingredients to include things like green onions, mushrooms, spinach, etc.) When the crust is done, pour the egg mixture into the pie pan and return to the oven. Lower the oven temperature to 350 and bake for about 30-35 minutes until the quiche is cooked through (check the middle – that was the last to settle for me). Kale the super food! Listen to this: kale is very high in beta carotene, vitamin K, vitamin C, lutein, zeaxanthin, and reasonably rich in calcium. It claims to have potent anti-cancer properties, has a chemical which boosts DNA repair in cells and appears to block the growth of cancer cells, provides cardiovascular support by helping lower cholesterol, and assists in the body’s detoxification process. Kale is a cousin to broccoli, cabbage and brussel sprouts and it peaks from the middle of winter through the beginning of spring. Flowering kale looks nice in your garden. But enough about that. How does it taste? 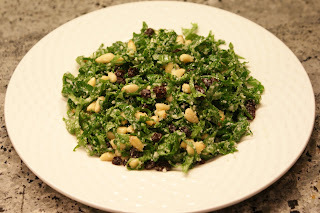 Let’s just say that my oldest proclaimed “I don’t eat salad.” However after he tried it, he changed his tune: “can I have a whole plate?” My friend Julie W. loves eating this salad when she is in Aspen, CO. She found the recipe, made it for a girls’ lunch recently, and the kale salad has arrived on the Dallas scene. This salad originated at the restaurant, LuLu Wilson, which has since closed but if visiting Aspen, stop by CP Burger and try it there. Or if not traveling soon, make one at home. Using a very sharp knife, cut away the kale leaves’ tough center stems. Roll the leaves like a cigar and cut them into very fine thin slices, about 1/8th-inch wide (aka, chiffonade). Put kale and olive oil into a bowl and toss by hand. Add the lemon juice and toss again. Add the currants, parmesan, and pine nuts and toss by hand until completely mixed. Taste and adjust quantities if needed. 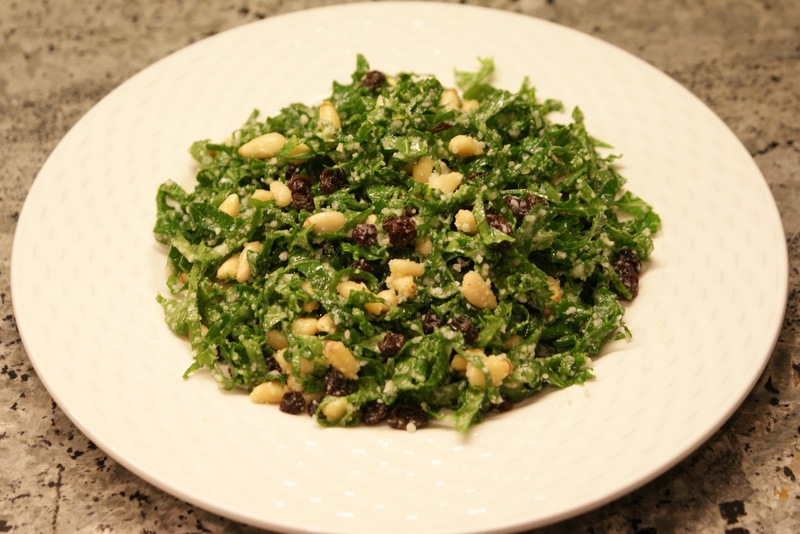 The salad can be made a few hours ahead, but better if prepared just before serving. Pucker up! Chefs tend to have a signature ingredient – Ina loves lemon; Paula Deen favors butter and cream; Bobby Flay prefers anything grilled. 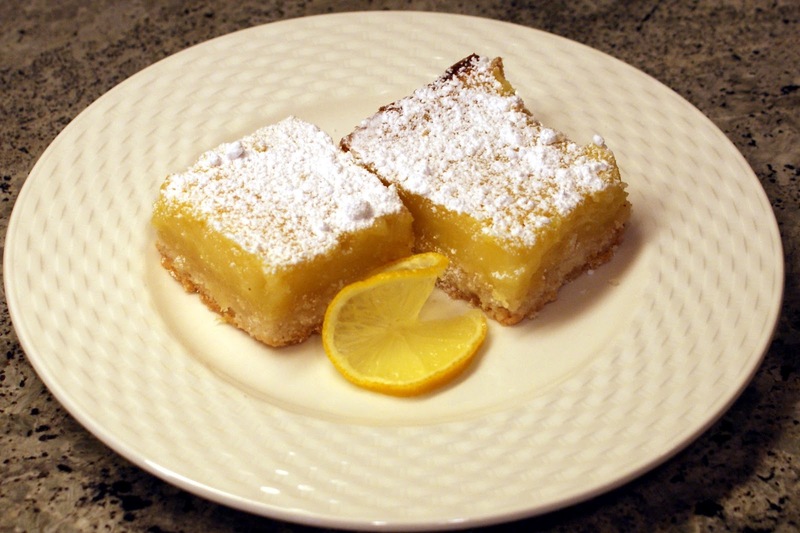 This recipe from The Barefoot Contessa Cookbook delivers on the tart and tangy that you would expect from a lemon square. If you prefer a doughier version, let me know and I’ll send you Sharon’s crust-on-crust lemon square recipe. This recipe has graced many friends’ tables, Julie K. and Chris B., to name a few. The intent of The Baker’s Mann is to cook and share your best. 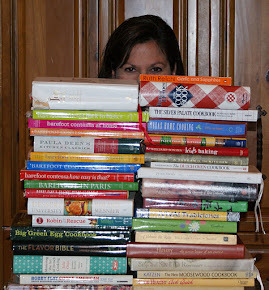 It is recommendations like this from friends that inspire the blog so please keep the recipe ideas flowing. All you have to do is share the recipe – the cooking, picture taking and write up are all included in your subscription and provided by the “professional” staff at TBM. Pucker up as you bite into this treat and pucker up on this Valentine’s Day while giving a kiss to your loved ones – a spouse, a child, a parent, a friend, a dog, a cat – those special people who give you unconditional love every day. They nourish your heart and soul just as food nourishes your body. Happy Valentine’s Day! In an effort to recreate the Mongolian beef at Pei Wei, I started searching for beef kabob recipes. I found this one and while not as sweet as Pei Wei, it does have some soy flavor. If you serve it with a side of rice, spear a mushroom and close your eyes… no, not really. I’ll keep searching but this flavor doesn’t disappoint. This is my youngest’s (that is younger by 1 minute but his sister still likes to claim that she is his big sister) favorite dishes. The original recipe calls for beef tri-tip which is a cut of meat that comes from the sirloin. 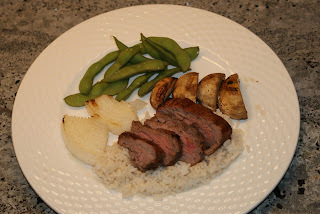 Kuby’s sells beef tenderloin tails for $10/lb less than a center-cut tenderloin (do the math with me – I know it’s late - $25/lb vs $15/lb). I figured that the tips are from the same place (the short loin) as a center-cut tenderloin and as a kabob, you’re cutting it into smaller pieces anyways so why pay more? Combine ingredients #2-6 to make the marinade. Add salt and pepper to taste. Pour over the beef tenderloin tails or tri-tip cut into cubes for a 1-3 hours. Skewer the beef with onion and mushroom. David thinks skewers are cumbersome so he places everything individually on the grill and then does lots of flipping. Either way. Beef: it’s what was for dinner. If you didn't win the Maverick Redi Fork Pro meat thermometer in the drawing, the nice folks at Barbecues Galore on Lovers Lane in Dallas (4360 Lovers Ln near the Tollway) have offered 10% off this meat thermometer if you mention The Baker's Mann. Eat your veggies. 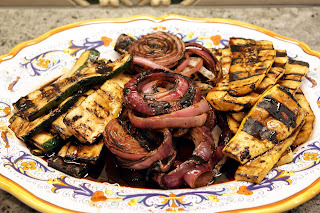 Those words are about as appealing to me as “pull over” or “it’s time for your annual eye exam.” Dress up your grilled vegetables with this balsamic glaze. It’s a tasty combination of tangy and sweet. Almost enough to drown out the taste of the veggies. Just kidding! In a medium sauté pan over medium heat, add vinegar, brown sugar, and honey. Let simmer for 15-20 minutes or until reduced by half. Keep warm for glazing on the grill. In a 1 gallon resealable bag, add the balsamic vinegar, olive oil, salt, pepper, and garlic and mix until combined. Next, add the carrots, celery root and onions, remove excess air. Allow to marinate for 30 minutes. Then add the zucchini and squash and allow to marinate for 10 more minutes. Obviously you can adjust the veggies to be whatever kind and quantity you like. Brush grill with oil. Preheat the grill to medium-high. Add onion, carrots and celery root. Cook on both sides for 3-5 minutes brushing with balsamic glaze. Mark and brown evenly on both sides. Remove to holding pan and cover with aluminum foil. 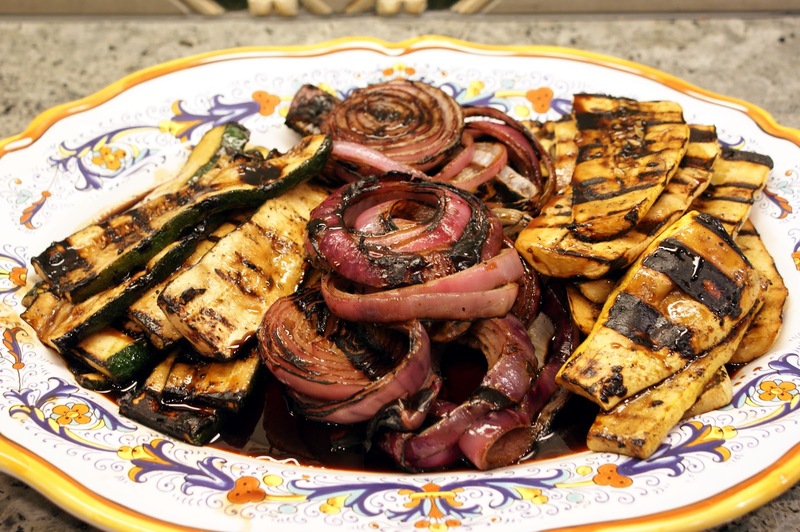 Add squash and zucchini to grill, brush with glaze and cook for 2 minutes per side until marked and evenly brown. Remove to holding pan and cover until ready to serve. Drizzle veggies with remaining glaze and serve. The more you allow the glaze to cool, the thicker and glaze-y-er it gets. "Eat your veggies" never tasted this good! * Signed up to be a Follower. 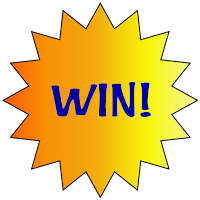 You can sign up by clicking "Join this site" under "Followers"
The drawing will occur on Friday, Feb. 10. 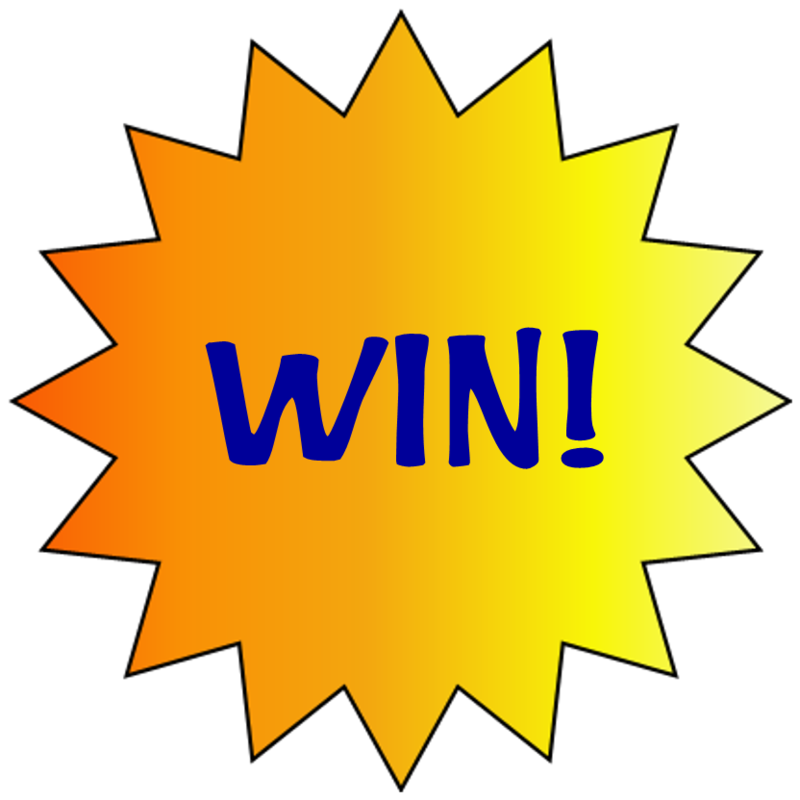 You need not be present to win - the prize will be mailed to you. The winner will be announced via a TBM post on Friday.